Astronomers examine pairs of tiny colliding galaxies, twisting each other and tugging at their clouds of gas. 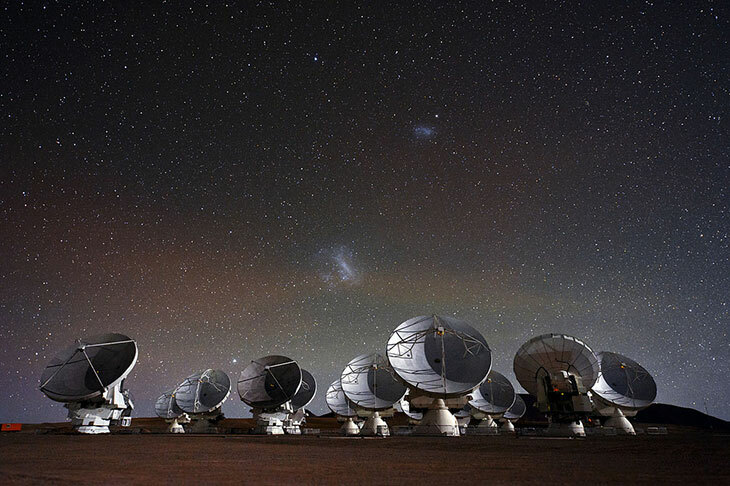 The Large and Small Magellanic Clouds are visible in the sky above the Atacama Large Millimeter/submillimeter Array (ALMA), a radio telescope in Chile. (Inside Science) – Two nearby dwarf galaxies, known as the Large and Small Magellanic Clouds, are in the process of crashing into each other as they gradually tumble into the Milky Way, like dueling siblings orbiting their parent galaxy. But in spite of their proximity, this pair had been poorly understood since their discovery centuries ago. Now a group of astronomers have carefully mapped out other similar dwarf galaxies, uncovering new insight into how they draw out puffs of gas from each other like a child grabbing a fluffy handful of cotton candy. "We still know very little about these small galaxies even though they're the most common throughout the history of the universe," said Gurtina Besla, an astronomer at the University of Arizona in Tucson and member of the collaboration. As their name suggests, "dwarf" galaxies are like more familiar galaxies but they're much smaller. Millions or even a billion stars swim and swirl within dwarf galaxies, while the Milky Way and other big spiral galaxies host hundreds or thousands of times more stars. Many wispy clouds of hydrogen gas inhabit the dwarfs though, providing the potential to coalesce and form new stars, driving the continued growth of the fledgling galaxies. "Dwarf galaxies have a huge amount of gas, so their interactions have a more dramatic effect," said Sarah Pearson, a graduate student at Columbia University in New York City and lead scientist on the project. The gas clouds fuel bursts of star formation in a cyclic process, Pearson explained. She and her team find that when gravity pulls two dwarf galaxies together, they twist each other like taffy, producing bridges and tails between them. Their findings, available here, will be published in the June 21 issue of the Monthly Notices of the Royal Astronomical Society. Interactions between the galaxies make their gas more diffuse, pulling it away from the more concentrated conglomeration of stars. These gas clouds act like planes on an airport runway, biding their time until they can come in and bring their contents to the stellar terminal. The loosely bound gas is parked in the galaxies' outskirts, where it will rain back down and later feed bursts of star formation. The dwarf galaxies' environment matters though. When their gas is so spread out, it can get stripped away by a sufficiently close large neighbor. Such a neighbor exerts a strong gravitational pull if it's only a few hundred thousand light-years away. This appears to be happening with the Magellanic Stream, a tail of gas trailing behind Magellanic Clouds. "The combination of stripping and tides is shaping the stream, and the Milky Way is already stealing the gas," Pearson said. The Magellanic system contains a lot of gas, a larger fraction than held by bigger galaxies, which often have older stars and little fuel to make more. If the Milky Way were to eventually capture that gas, this would build up our galaxy's more meager supply. "Whatever forms the Magellanic Stream may be an important process for feeding galaxies like our Milky Way," Besla said. Colliding small galaxies make bigger galaxies, which may themselves merge and assemble even bigger ones, according to astrophysicists' picture of galaxy formation. "Dwarf galaxies are just the first step, and they're the building blocks of all the larger galaxies," said Mary Putman, an astronomer at Columbia University and co-author on the paper. The team, led by Pearson, put together their picture by examining a diversity of dwarf galaxies in different environments. They had to focus on the "local universe," within 100 million light-years, as dwarf galaxies give off relatively faint light. But they found a pair of them in a remote environment, resembling what the Magellanic Clouds might have looked like before they moved to the Milky Way's neighborhood. Seven of the 10 dwarf pairs have bridges of gas connecting them, indicating previous interactions and close passes. "It's interesting that they find these bridges everywhere, which confirms that the Magellanic Clouds might be have been interacting with each other before falling into the Milky Way," said Laura Sales, a University of California, Riverside astrophysicist not involved in the study. "This is important work in an area that hasn't been explored much, and it's the first time people have mapped the gas distribution of a feasible number of dwarfs," she added.